I am not the best when it comes to Christmas decorations. I've never gone and cut my own Christmas tree, even when I lived in Vermont. I've never put Christmas lights on the outside of my house. Given the chance, I'd probably leave all the boxes marked "Christmas Decorations" down in the basement. The only "decorations" I've ever personally bought have been Christmas tins, and only because they were an excuse to purchase the candy or cookies they contained. But there are two Christmas traditions I enjoy faithfully every year; watching Christmas movies, no matter how bad, and listening to Christmas music, which is almost never bad..
To put it bluntly, I am a sucker for Christmas music CD's. My collection of Christmas music contains everything from Renaissance Christmas music to Motown Christmas to the Choir at St John the Evangelist Christmas to the Alligator Records Christmas Blues Collection. I have CD's made from tapes of old radio broadcasts with Frank Sinatra and Bing Crosby. Given the breadth and scope of this collection, I can offer (and am about to) a list of my favorite Christmas music. This is not a "Top 10 Christmas Tunes of All Time" list, so don't worry if your favorite isn't here. Silent Night - I'm not crazy about Sarah McLachlan's version, but most others are good. Blue Christmas - Some people tell me I sound just like Elvis when I sing this. Okay, no one ever really tells me that except myself. But I think it's true. Greensleeves - This didn't start out as a Christmas tune, but most people associate it now with Christmas. I'll Be Home for Christmas - a poignant tune, especially in times of war in foreign lands. Have Yourself a Merry Little Christmas - Judy Garland being the definitive performer of this song, but there are a number of other interesting versions. Ave Maria - Similar to Greensleeves, Ave Maria (Latin for "Hail Mary) is not specifically a Christmas song, but one often hears the song at Christmastime, and it appears on many Christmas CDs. I personally like Perry Como's version, but any singer with a good voice does well. I'd Like You for Christmas. This is only on the list because of my admitted obsession with Julie London's recordings, which started out innocently enough. I'd become interested in that series of Ultra-Lounge CD's (think lounge lizard music, and you won't be far off), and had purchased - because it was on sale - Volume 4, Bachelor Pad Royale. And one of the songs on that CD is Julie London's Black Coffee, which I'd never heard before and instantly fell in love with. So, this year, I searched to see if there were any Julie London Christmas songs, and there is one which, not surprisingly, is available in an Ultra-Lounge Christmas compilation. There are also very memorable variations on the songs listed. I won't go into all of them here, except to mention that, as a young (younger, anyway) person, I was deeply impressed by Simon & Garfunkel's 7 O'clock News / Silent Night. The Vietnam War was going on when I was listening to it back then, and that had something to do with it. 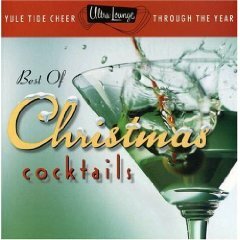 There are two other Ultra-Lounge Christmas Cocktails CD's in addition to the one mentioned above, as well as Ultra-Lounge: Best of Christmas Cocktails, which has a different Julie London Christmas song, namely, I've Got My Love to Keep Me Warm. 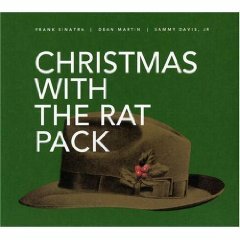 I also think this is the year I break down and buy Christmas With the Rat Pack, which has 21 songs; among them, interestingly enough, is Frank Sinatra's version of I've Got My Love to Keep Me Warm. "I too am a complete fool for Christmas music. I appreciate your web site and would ask if you could lead me to the single CD you would consider a definitive collection of traditionally performed seasonal/Christmas songs. I have a Bing Crosby and Season’s Greetings from Perry Como, but find I would really prefer a compilation of spiritual songs and seasonal songs with a variety in performers. Does anything pop into mind?" Update (sort of): Well, I still don't have a definitive answer to the question posed above, but I've put Ultimate Christmas on my Wish List, because I think it just might be a decent single-CD compilation of Christmas tunes. There are seventeen songs on the CD, among them Judy Garland's Have Yourself a Merry Little Christmas, Elvis Presley's Blue Christmas, Luciano Pavarotti's Cantique de Noel (O Holy Night), and Bing Crosby's White Christmas. Not all of the tracks are must-have songs - I've just never been a fan of Eartha Kitt's Santa Baby, though I know it was a big hit - but, overall, it seems like a great CD. Did I mention Nat King Cole singing The Christmas Song....? As a side note, Season’s Greetings from Perry Como is, as our correspondent infers, an excellent Christmas album, and so is Perry Como Christmas. I'd almost forgotten how much I enjoyed Perry Como's voice until a business engagement caused me to spend most of 1997 in the Philippines, where his recordings were regularly broadcast on the radio. That experience, in turn, brought to mind Perry Como's annual televised Christmas shows, which were uniformly enjoyable. Last year, I purchased Verve Presents: The Very Best of Christmas Jazz, which works well for those days during the holidays when you feel overwhelmend and want to pretend you're back in the past, spending Christmas Eve in some family tavern.